Well, we might be aware that minimum wage earners (MWE), among others, who are earning purely compensation income are not subject to income tax and therefore not subject to withholding tax while those who are earning above minimum, except those that are expressly enumerated by the National Internal Revenue Code (NIRC), their income are taxable and are therefore subject to withholding tax. Withholding tax computation is not that complex, as you may just refer to the withholding tax table issued by the Bureau of Internal Revenue (BIR), with a twist. The last time this withholding tax table for compensation income was updated was in 2008 when the BIR issued a regulation implementing the tax exemption for MWEs and increasing the basic personal exemption to P50,000 regardless of the tax status (single, married, removing the “head of the family” classification) and P25,000 for each qualified dependent up to a maximum of four (4). Withholding tax computation is not complicated but it is not that straightforward as well. You will be surprise by the fact that many companies don’t get this thing right, despite that it is detailedly discussed in Revenue Regulation 10-2008. Read below and check whether you are doing it the way it should be. What Is Wrong with the Way We Do It? Disregard all other payroll items, how much should be his withholding tax? We provided METHOD 1 and METHOD 2 for your option, unless you have other way to compute it. Which one do you think is correct? See Summary of Previous Responses here. Revenue Regulations (RR) 10-2008 sets forth the steps to determine the amount of tax to be withheld and provided sample computations to that effect. Section 3 of the RR No. 10-2008 amends the section 2.79 of RR No. 2-98 which details the computation of withholding tax on compensation in general. Significant provisions that supports the answer to the above example situation are as follows. Step 3. Segregate the taxable compensation income as determined in Step 2 into regular taxable compensation income and supplementary compensation income. Regular compensation includes basic salary, fixed allowances for representation, transportation and other allowances paid to an employee per payroll period. Supplementary compensation includes payments to an employee in addition to the regular compensation such as commission, overtime pay, taxable retirement pay, taxable bonus and other taxable benefits, with or without regard to a payroll period. Step 4. Use the appropriate tables mentioned under Section 2.79 (B) (1) for the payroll period: monthly, semi-monthly, weekly or daily, as tge case maybe. (i) Determine the line (horizontal) corresponding to the status and number of qualified dependent children using the appropriate symbol for the taxpayer status. (ii) Determine the column to be used by taking into account only the amount of taxable regular compensation income. 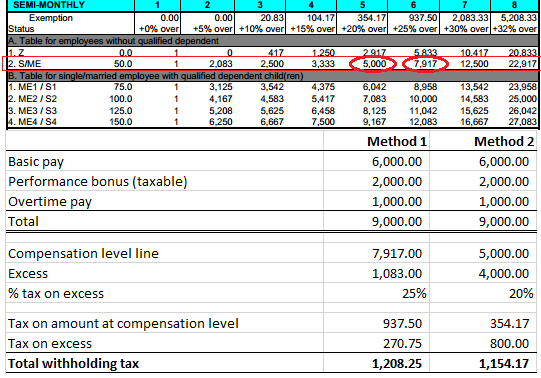 The compensation level is the amount indicated in the line and column to which the regular compensation income is equal to or in excess, but not to exceed the amount in the next column of the same line. Step 6. Compute the withholding tax due by adding the tax predetermined in the compensation level indicated at the top of the column, to the tax on the excess of the total regular and supplementary compensation over the compensation level, which is computed by multiplying the excess by the rate also indicated at the top of the same column/compensation level. To read the entire steps in computing withholding tax on compensation as prescribed by RR No. 10-2008, click here to download the regulation and read through page 8 onwards. To download the updated withholding tax table for compensation income, click here.